As Spring takes hold and we look forward to Summer, there are a range of outdoor access improvements and opportunities across the region ready for use in 2019. Dumfries & Galloway already has an enviable offering for people keen to experience the great outdoors, hosting more than 1900km of Core Paths and 3 of Scotland’s Great Trails: The Southern Upland Way, The Mull of Galloway Trail and The Annandale Way. These will soon be joined by the Rhins of Galloway Coast path. Gatehouse Station to Mossdale: A brilliant 8-mile moorland route running along the old railway through the heart of the Dark Sky Park, the Galloway & Southern Ayrshire UNESCO Biosphere and the Galloway Forest Park giving off road access to the Cairnsmore of Fleet nature reserve. Improvements made to drainage and surfacing along the route, with a new bridge at Loch Skerrow, provides non-vehicular access through some of the most remote landscape in the region. This route was the inspiration for John Buchan’s ‘39 steps’ and offers the possibility of seeing Golden Eagles! 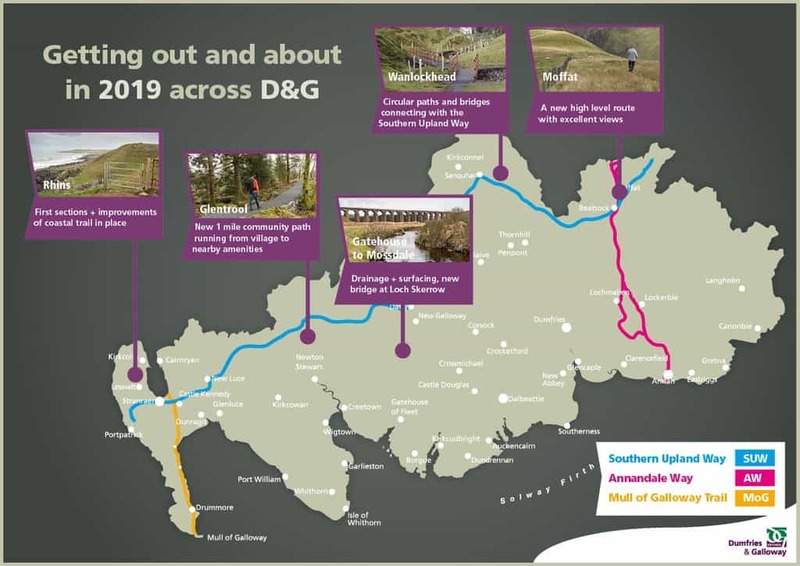 Improvements to this route were funded through the Scottish Natural Heritage administered ‘Improving Public Access’ fund and were undertaken by Dumfries & Galloway Council’s Environment Team in partnership with the Galloway Glens Landscape Partnership. Glentrool Community Path: A project developed in partnership between the Dumfries & Galloway Council’s Environment Team, Glentrool & Bargrennan Community Trust and the Forestry Commission. A one-mile path that runs from Glentrool to local amenities, preventing the need to walk along the road. Funding provided by the Improving Public Access fund, D&G Council and Kilgallioch Windfarm. Rhins of Galloway Coastal Path: This will be an 83-mile circular route that can be started and finished in Stranraer and takes in some of what is arguably the best but least well-known parts of Scotland. The full project, with associated interpretation and community engagement works will be undertaken over the next three years. The first stages of the path improvements are now in place, including the stretch on the North West of the peninsula, south of Corsewall point lighthouse. As the larger project gets underway, users will notice improvements to the coastal path taking shape. Funding has been secured from the Coastal Communities Fund, the National Lottery Heritage Fund and the Improving Public Access scheme and the project has been developed and is being delivered by Dumfries & Galloway Council’s Environment Team. Moffat High Path: This route, created over recent years but now formalised with signage and waymarkers provides users with a much better view and experience. The website has been updated as well to embed this new route. Southern Upland Way: 214 miles running from Portpatrick to Cockburnspath in the Scottish Borders. This has now been in place for more than 20 years, with use increasing recently. Revised and updated Guide book recently published by Cicerone. Single Ordnance Survey Map now available to cover the whole route. Ongoing maintenance and management activities to maintain and improve access. Southern Upland Way website: southernuplandway.gov.uk. Annandale Way: Dedicated website: http://annandaleway.org/ First guide book published recently. Mull of Galloway Trail: Dedicated website: mullofgallowaytrail.co.uk This will form a leg of the Rhins of Galloway Coast path.